That is what these colors remind me of; cool, creamy sherbet. This is the bishop talked about in this post. Excuse my shadowy pictures. Dark and dreary day here, so there is no natural light to take pictures with. This little bishop is made using Children's Corner Bishop pattern and smocked with Woodland Fairy from Australian Smocking and Embroidery Issue #49. Again the fabric is Skip Dent from Bessie Mary. As I stated in the previous post about this dress, I used overdyed flosses. I like how it turned out. I piped it with pale pink. 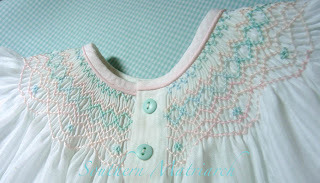 I used aqua buttons also from Bessie Mary down the back. I have been asked about how I choose to close the backs of my bishops. I ALWAYS button them down the back. 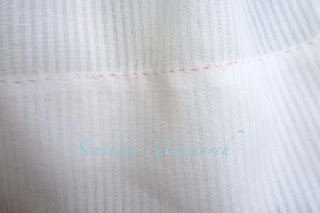 I like the way it looks and it is a bazillion times quicker and easier, for me, than a continuous placket inserted into the back. 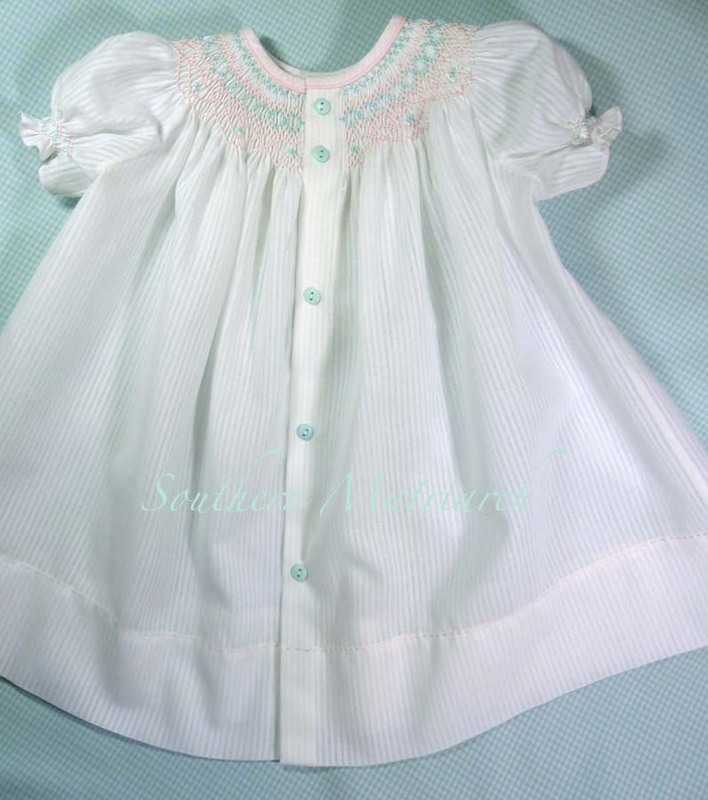 Besides if you did the continuous placket you wouldn't see those cute aqua buttons. It also makes it easier to dress baby when you can flop her on her tummy and button the dress. 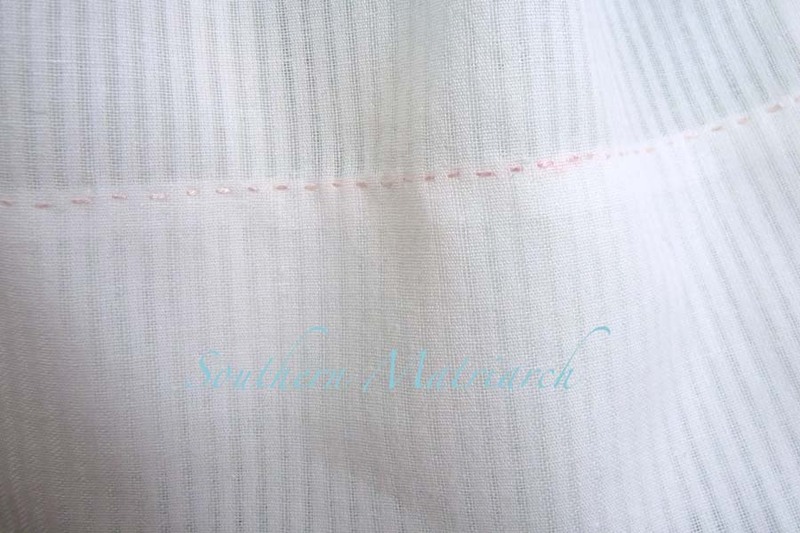 For the hem, I used two strands of floss and ran a running stitch for a sweet hint of color at the hem. I have the other baby girl gift finished as well. I will post it in a day or so. Off to wrap this one and then I have two baby boy gifts to make. I hope your days are filled with stitching too, faithful reader. I love how that turned out, the colors are just so pretty and delicate. I, too, am a big fan of cute buttons all the way down the back! Love the pink touch at the hem! So dainty and just "scrumptious!" I love it! Just beautiful. Just yummy, like a bowl of sherbert! I love how you finished the hem. The smocking is lovely with the overdyed floss. I too am in favor of buttons down the back. So much easier to sew and to dress Baby. This is just precious! Love it! So sweet. 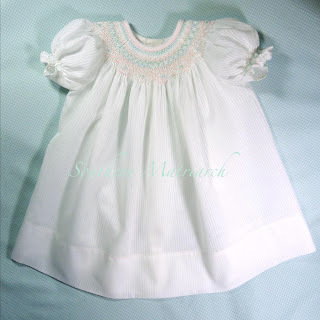 Many years ago, I made my niece a smocked bubble that buttoned down the front. At church one Sunday, in the nursery, my sister handed me Megan and apologized that the outfit was on backwards. My brother in law insisted that the buttons be in the back. I changed the outfit around and BIL learned that next time he would need to listen! BTW, Megan (25 yrs old) is now a missionary/teacher in India. What a beautiful dress for a beautiful girl! I just had our third baby on Monday - a little girl after two big brothers. 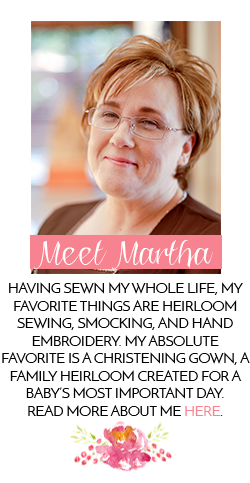 I'm sending my mom a link to your blog in case she needs any inspiration :-) I enjoy sewing as well, but my time is somewhat limited these days (and I have to send everything to her to be pleated)!